A perfectly-crafted gem from Paraguay that should put the country's film industry on the map. If you’re not familiar with Paraguayan cinema, that’s hardly surprising: the South American country produced a handful of films during the entire twentieth century. But it only takes a single filmmaker – a Bergman, von Trier or Haneke – to put a country on the map. 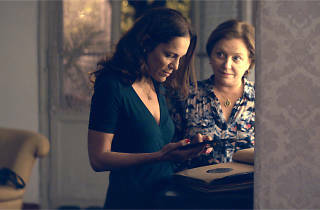 On the evidence of ‘The Heiresses’, director Marcelo Martinessi might be the one to do it. Bonus points for making the most Bechdel test-friendly film of the year. Middle-aged couple Chela (Ava Brun) and Chiquita (Margarita Irún) have enjoyed being part of Paraguay’s wealthy elite, but straitened times mean big changes are on the way. Mounting debts lead to a spell in prison for Chiquita, treasured possessions are being sold off, and Chela resorts to running a taxi service for well-to-do women. Humiliation would appear to be all that their future holds, but venturing from her rusting gilded cage leads Chela to enjoy new freedoms, including sensual bisexual Angy (Ava Ivanova), and a future ripe with possibility. Working from his own exquisitely observed script, and interpreted by phenomenal actors with barely any screen experience, Martinessi creates a beguiling, female-centric story that has an almost Almodóvar-esque understanding of women. It’s directed with a documentarian’s sense of realism, cleverly anchored to Chela as the film’s viewpoint. It’s an assured feature debut and it isn’t too much of a stretch to see Chela’s late flowering as analogous to Paraguay’s bright future on the screen.